When you are new to a city or a neighborhood, everything is different. You have to go through the painful, yet exciting, process of finding a new routine. Where to shop for groceries? Where is the local post office? Are there any professional cleaners near me? Is there laundry service near me? When selecting a new place to get your clothes dry cleaning done, you should consider a range of factors. Austin cleaners services are not all created equal. Below are several factors you should consider when picking your new local dry cleaners. An important consideration for selecting an Austin cleaners is convenience. Simply asking, “Is there a cleaner near me?” or "How do I find the nearest dry cleaners near me open today?" is only part of what you should look at. Do they have convenient parking? Do cleaners near me stay open late or are they open on weekends? Do I need to go to go to a dry cleaners near me or do they offer a dry cleaning delivery service? Who can be my weekend dry cleaners service? Also important in picking an Austin cleaners is whether they provide all of the services you need. Do they provide laundry service? Are they wet and dry cleaners or do they only use a dry cleaning process? Do they offer wash & fold by the pound or have Laundromat services? Can they clean all of my household items? Are there items they do not clean? Do they offer a drycleaners delivery service? Are they on-site dry cleaners? Finding the best dry cleaners can be difficult.You should ask your neighbors if they have any nearby dry cleaners to recommend. The Austin Chronicle published a “Best of” list every year. In addition to highlighting the best small businesses in Austin, it tells you about the best dry cleaners Austin has to offer. Most Austin cleaners have reviews on Yelp! and Google+ that give you more information on how dry cleaners near to your home have performed in the past. In some markets there are 24 hour dry cleaners to clean your clothes any time of day or night. Express dry cleaners will offer 1 hour service. Same day dry cleaning service is also very common, but requires that clothes be in typically by 9 am for return by 6 pm. Most dry cleaners will offer 24 hour turn around on cleaning services. Make sure that the cleaner you select has the turnaround time you need. For many people, looking for a local dry cleaners is a priority. They want to do business where their dollars stay in the local community and where the business supports local organizations and causes. Within Austin that may even happen at the neighborhood level. Some people may only want to spend their dollars with south Austin dry cleaners. Green dry cleaning, organic dry cleaning, eco-friendly dry cleaning. No matter what you call it, dry cleaning processes that uses environmentally safe methods are becoming an important factor in where people choose to get their clothes cleaned. Most consumers have not stopped to ask “What is dry cleaning?”. When they do they quickly learn that the majority of dry cleaning is done with a dangerous chemical (perc) that should have been phased out of the industry decades ago. Like many other services, dry cleaners charge a range of prices for the same item. Many of the factors previously mentioned will contribute to the differences in price. More convenient locations, higher quality, green dry cleaning methods, range of services & speed all play a part in why cleaners charge different prices. If your only goal is to find a “cleaning service near me or a laundry service near me”, then many of the considerations listed above won’t be that important. 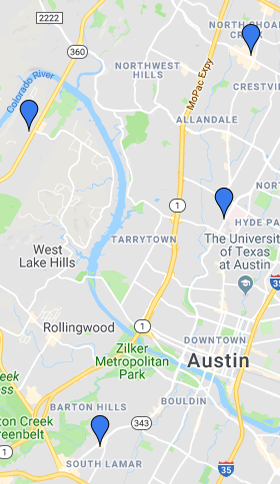 If you live in South Austin and think that all dry cleaners South Austin has to offer are created equal, then the considerations listed above won’t matter. But if you are looking for the best cleaners Austin has that fit the things most important to you, we recommend you take a balanced approach in picking your cleaner.